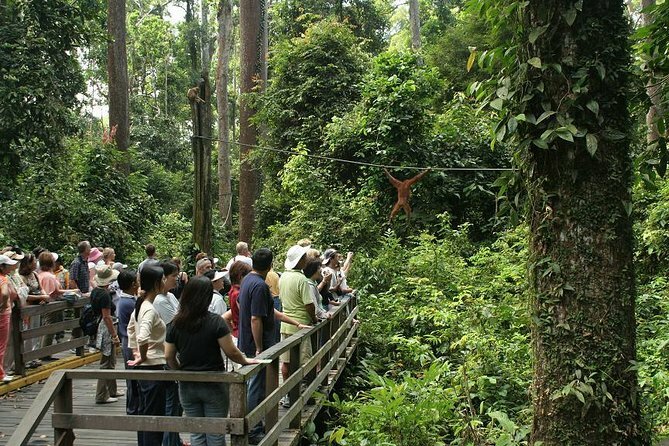 See orangutans in the rainforest at the Sepilok Orangutan Rehabilitation Centre. This unique wildlife sanctuary specializes in caring for baby orphan orangutans and teaches them the survival skills they would have learned from their mothers under normal conditions. The young orangutans are not kept in captivity, but rather come and go as they please while adjusting to their natural habitat. Lunch and a city tour of Sandakan are included. The facility provides medical care for orphaned and confiscated orangutans as well as dozens of other wildlife species. Some of the other animals which have been treated at the center includes sun bear,gibbons,Sumatran rhinos and elephants. At Sim Sim water village where houses are all built close to the water surface while observing the fascinating view of the sea. Trip very good only negative pick up meant to be 4 am but didn't arrive until 4.30 very annoying as could have had extra 30 minutes in bed.